Apple Inc. has announced the launch of its new wireless Magic Mouse, which the company claims as the world’s first mouse to utilize Apple’s revolutionary Multi-Touch technology, featuring a seamless touch-sensitive enclosure that allows it to be a single or multi-button mouse thanks to the advanced gesture support, allowing left or right handed users to scroll in any direction and to pan a full 360 degrees by simply touching anywhere on the smooth, seamless top shell. The amazing Magic Mouse incorporates powerful laser tracking engine that’s far more sensitive and responsive on more surfaces than traditional optical tracking engines. 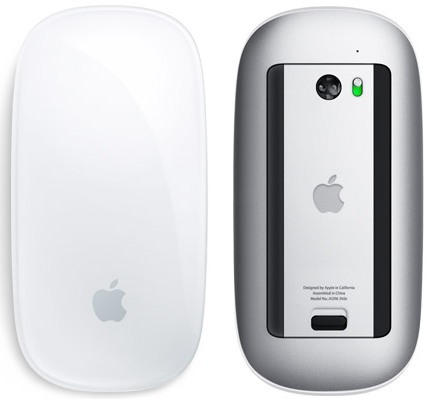 Furthermore, Magic Mouse connects wirelessly to your Mac via Bluetooth wireless technology, delivering a reliable, secure connection up to 10 meters (33 feet) away. According to Apple, Multi-button or gesture commands can be easily configured from Magic Mouse preference pane in System Preferences. Apple’s new stylish Magic Mouse comes standard with every new iMac is slated to be available later this month for a suggested retail price of $69, compatible with Mac OS X version 10.5.8 or later.